“Is this really where we live?” I ask Flynn. Half a question and half a pinch-me-because-this-doesn’t-feel-real statement. Settling into our deck chairs on the edge of our camp overlooking the Chamonix valley, the mountains are starting to turn pink. My favourite part of the day. Somedays I miss the moment they turn pink because I’m inside, sometimes they are covered in clouds and hidden from view. Today there is not one cloud in sight and there they are, right in front of us, turning pink for all to see. We are at eye level with them, nestled into the opposite side of the valley. Flynn takes a swig on the bottle of whiskey and passes it to me “I know, right” he says. And then there is silence. We are all listening, watching and being. By this point Sean and and Steve have finished their ‘work’ for the evening. Camp has been set up, and by that I mean we have dug pits in the snow to sleep in and give us a little protection from the cold. It’s February and we’re sleeping at 2595m, for no reason other than because we fancied an adventure. How often in life do we just sit and be? Be in the moment, absorb it, let it roll over us without judgement? We have so many demands on our time, it can be difficult to truly switch off. With it being Sean’s last night in Chamonix, I decided to plan an adventure. Sean and I have completed the 3 Peaks Cycle Challenge together, cycled London to Paris in 24 hours and I joined him on his walk from Cheltenham to London. An alpine winter bivvy seemed like a perfect addition to the adventure list. Armed with supplies, the four of us took the last lift up the mountain from Chamonix at 4:30pm and found a perfect spot perched on the edge of the mountain to set up camp. We evaded a few curious looks from lift attendants and survived the mountain rescue team questioning our plans. Although they advised it was “strictly forbidden” to camp here, they had no qualms about letting us stay the night. Thankfully! There’s something extremely special about Chamonix and the people who live here. Brought together by a passion for the mountains and the inescapable draw to this place we’ve made home. I met both Flynn and Steve through skiing and climbing. Through a shared passion to explore the mountains and our limits. What makes it interesting is the paths that have led each of us here. 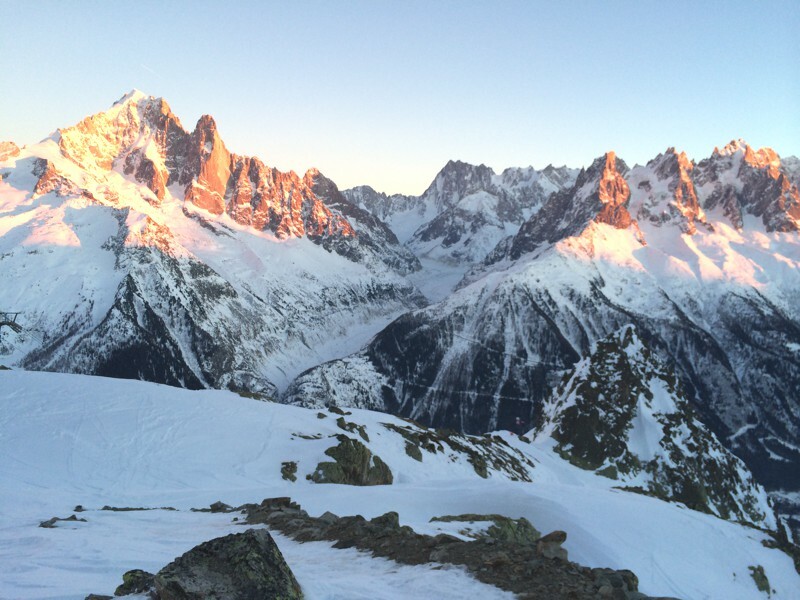 Not just to Chamonix, but to who we are today, and to the reasons that being in the mountains means so much to us. Everytime I look in a different direction the view changes. The colours are twisting and the shades deepening. As the sun sets over Mont Blanc, the shadows become darker. Blue turns into pink, pink turns into a darker blue and then dusk falls. As dusk becomes night, the stars come up and we begin to count them. The brightest ones shine first, then there are so many it fills me with wonder and I lose count. Being in this moment makes any pressures or thoughts from day to day life pail into insignificance. I’m humbled by how beautiful this place is, this world and how it makes me feel.Alive, inspired, happy. Throughout the show from the mountains, we’ve been drinking whiskey and talking. Sharing tales from the journey so far and plans for the road ahead. The whiskey has finished now and we’re wrapped in darkness. A night that is so dark yet we don’t need headtorches because the light of the mountains, the stars and the glow from the Chamonix valley is all we need. We’ve been drinking apple and cinnamon infused whiskey and decide to see if we can get the apples out of the bottle and eat them. Steve fishes them out with some cunning work and we take a slice of apple each. The first one tastes ok, strong, but ok. We go in for a second slice and this is where it all goes pear shapped. They are way too strong to eat, my stomach churns. Luckily we have some more whiskey somewhere. We dig it out and continue chatting. By 11pm it feels like time to say goodbye to this beautiful night and get some shut eye. It’s cold and I’m looking forward to snuggling up in my sleeping bag. Flynn, Steve and I are sharing a two-man tent. Sean is sleeping in the open air like the wild man he is. The night feels cold and slightly uncomfortable. I wake every hour and look at my clock, waiting for sunrise. Finally I open my eyes and can feel that it’s light outside. I climb outside the tent and enjoy the dawn. Although it’s well and truly light, it will still be a few hours until the sunlight is actually on our camp and the lift is open. Steve and Flynn are awake and Sean is stirring. They all slept well and none of them were cold. Apparently my tent buddies even felt “a bit too warm”. Looks like I need a new sleeping bag then! By now we feel like old friends. We’ve spent a night in the high mountains together, sleeping at 2,595 metres. It didn’t take much to create this experience, and none of us will forget it in a hurry. What we needed were willing companions, a desire to do something different and a bottle of whiskey. I might have been cold and a little uncomfortable, but I have the rest of my life to sleep in my bed. Trying something new doesn’t have to be big, far away or expensive, it just requires us to look at things differently and be open minded.